What did Anne name her diary? When did she write in her diary? Why did Anne and her family go into hiding? What was the name of their hiding place? Why couldn’t they walk around during the day? How long were the Franks in hiding? What did the Nazis do when they found the Franks? Who lived through the concentration camp? 1.) Anne Frank called her diary Kitty. 2.) Anne Frank wrote in her diary from 12th June 1942 to 1st August 1944 during World War II. 3.) They went into hiding because Adolf Hitler, chancellor and dictator, wanted to get rid of the Jews. 4.) The hiding place was called the Secret Annex. 5.) They couldn’t walk around during the day because Hitler’s men were walking along the streets of Amsterdam. 6.) The Franks were in hiding for two years. 7.) The Nazis bring the Franks to a concentration camp. 8.) Miep Gies found Anne Frank’s diary, saved it and gave it to Otto, Anne’s dad, after the war. 9.) Anne died in Bergen-Belsen camp, she was 15. 10.) Otto Frank was the only one to survive. 1. Anne Frank called her diary kitty, 2.Anne Frank wrote her diary in hiding, 3.The Frank family went into hiding from the Nazis, 4. the name of the hiding space was the Annex, 5. the Frank family could not walk around during the day because they would get spotted, 6.The Frank family hid for 2 years 7.the Nazis threw them out and gave them only 5 minutes to pack, 8. Otto Frank found her diary.9 In the concentration camp, 10. Otto Frank. 1) Anne named her diary kitty. 2) She wrote in her diary everyday. 3) Anne and her family went into hiding to escape the nazis. 4) Their hiding place was called the secret annexe. 5) Because they might be spotted by the nazis. 1. ANNE NAMED HER DIARY KITTY. 2. SHE WROTE IN HER DIARY EVERY DAY. 3. ANNE AND HER FAMILY WENT INTO HIDING TO AVOID CONCENRATION CAMPS. 4. THEIR HIDING PLACE WAS CALLED THE SECRET ANEX. 5.THEY COULD NOT WALK AROUND DURING THE DAY BECAUSE THE PEOPLE DOWNSTAIRS MIGHT HEAR THEM. 8. OTTO SAVED ANNE DIARY. 2. Ann wrote in her diary every day. 4. The Frank family hid in a place called the Secret Annex. 5. They couldn’t walk through the day because Hitler and his army were searching four Jews. 6. The Frank family hid four two years. 7. When the Nazis found the Frank family they were sent to the concentration camps. 8. Otto found the diary of Anne. 9. Anne died in the concentration camps. 10. Otto was the only one to survive the concentration camps. 4.The name of the hiding place is the secret annexe. 6) The Franks were in hiding for 2 years. 7) The nazis put them into concentration camps. 8) Anne’s father Otto saved Anne’s diary. 9) Anne died in the concentration camp when she was 15 years old. 10) Anne’s father Ottto survived the concentration camp. 1. Anne named he diary Kitty. 2. Anne wrote in her diary each and every day. 3. Anne and her family went into hiding when Hitler turned against the Jews. 4. The name of her hiding place was the Secret Annex. 5. They couldn’t walk around in the day because then they would be caught. 6. The Frank family were in hiding for four years. 7. When the Nazis found the Franks they put them into concentration camp. 8. Otto, Anne’s father saved her diary. 10. Otto lived through the concentration camp. 1.Anne named her dairy kitty. 2.Anne tried to write in her dairy every day. 3.Anne and her family went in to hiding so none of Hitler’s men. 4.Annes hiding place was called the secret annex. 5.Anne could not walk around or speak loudly because someone down stairs might hear them and might be caught . 6.The eight people all stayed in the hiding place for two years. 7.When the Nazis found the Frank family they were all sent to concentration camp. 9.Anne died in the concentration camp. 1.Anne named her diary kitty. 2.Anne wrote in her diary every few days. 3.Anne and her family went into hiding to avoid concentration camps. 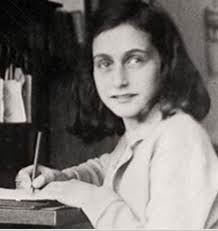 9.Anne died in concentration camps along with her mom and sister. 10.Otto lived through the concentration camps. Anne named her diary kitty. Anne wrote in her diary when ever she could. The family went in hiding from the nazis. The hiding place was called the secret annex. They couldn’t walk around so they would could not get caught by the nazis. They we’re takin to a concentration camps.